Rock Music Review is teaming up with TheMuncieScene.com to bring you a whole day of great music at the Midwest Music Summit! 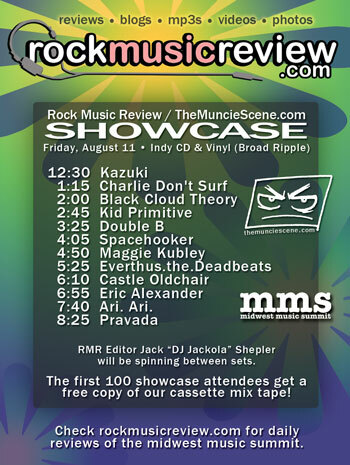 The showcase takes place Friday, August 11 at Indy CD & Vinyl starting at 12:30pm and lasting until 9pm. RMR Editor Jack “DJ Jackola” Shepler will be spinning between sets! The first 100 showcase attendees will get one of our hand-numbered limited edition cassette mix tapes, FREE! Besides our showcase, there will be over 300 bands playing on 25 stages in 3 days! And the best part…. if you buy your wristbands early they’re only $20! You can buy them online from Midwest Music Summit! 300 bands, 25 stages, 3 days = $20 in advance! To post this on myspace, use this html.